Geneva Paris: SNG/OB truck- Actua. 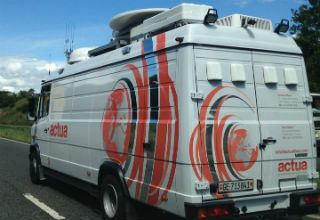 The Swiss broadcast services company, Actua, will be showing its new SNG/OB HD truck at IBC in Amsterdam. Actua - with production facilities in Geneva and Paris - has created an uplink vehicle for SD/HD simulcast applications with a high performance monitoring system, reliable power supply, on-board generator, UPS and isolation transformers. It works on a MPEG4 4:2:2/4:2:0 variable bit rate system. The vehicle will be based in the outdoor section of IBC at Stand OE109.